Yesterday, I braced my resolve and began to think about writing about John Donne. Well as you can see from my last post, I managed to produce an introduction to my relation, or rather my connection to Donne. What I intended to write was about was the connections between the books in my stock and Donne. The greater part of my inventory spans the years 1500 to 1700. Donne fits (at least temporally) right near the middle. I was educated, after my formal education set me loose on books, in an ever incomplete post-structural ,postmodern –>speculative :quest ,maybe pointlessly directionless guided (or not) by an anti-technique , found homeless in america a,theory and research that allows for multiple, non-hierarchical entry and exit points in data representation and interpretation. In short Rhizomatics. 5 and 6: Principle of cartography and decalcomania: a rhizome is not amenable to any structural or generative model; it is a “map and not a tracing” Yet as Baudrillard states in Simulation and Simulacra it is “the cartographer’s mad project of the ideal coextensivity of map and territory,” (Baudrillard) and is ever the tracing more than a layering,yet another Plateau? So here,now and at last (never finally) I will begin to map, trace outline and draw atop the works on John Donne. I’ll begin with an old outline and squirm around in what is on the shelf! A point of departure will be Tradition…The tradition began with nothing auspicious, Williamson begins with Ben Johnson telling Drummond ” that Donne himself,for not being understood would perish” Well, what can be said of this? We can look in Donne’s Letters and see if he ‘heard’ about this, no matter how unlikely, it will be fun to look through the letters…. and look at this,indeed I currently have for sale both a copy of Donne’s Letters, and Also a first Edition of Drummond’s works. Letters to Severall Persons of Honour: Written by John Donne, Sometime Deane of St Pauls London. 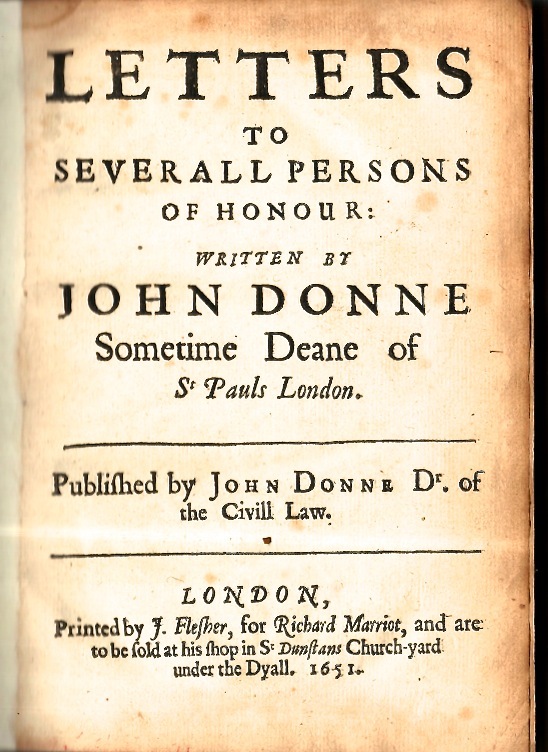 Published by John Donne Dr. of the Civill Law. Quarto, 7 x 5.2 inches. First edition. A-Z4, Aa-Ss4. [Lacking only the blanks A1 and Ss4]. This copy lacks the portrait of Donne. This copy is bound in full contemporary polished calf boards with gilt tooled edges; the binding has been rebacked and bears a label. The edges of the leaves are speckled red. The contents, on the other hand, are clean and tight, the paper generally in excellent condition. Notwithstanding the missing portrait, this is a very good copy. This copy is from the Damgard-Nielsen collection of John Donne, with his small bookplate inside the front board and his signature on the front free end leaf. Published posthumously by the poet’s son, John Donne (1604-1662), this collection contains 129 letters, written between December 1600 (a year before Donne’s marriage to Anne More) and March1631 (two months before his death). 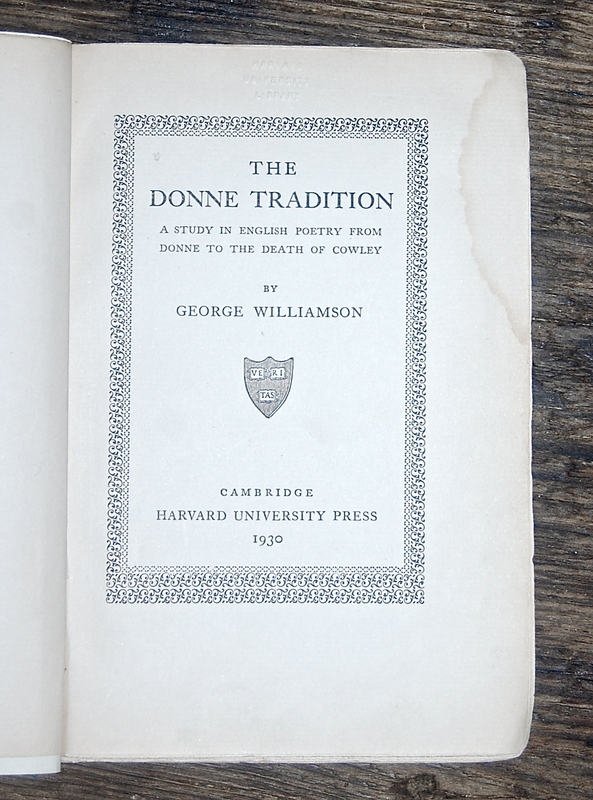 Drummond, despite the light Williams puts it, in his “Conversation betwixt the Famous poet Ben Johnson and William Drummond” States that Donne “is second to none and far from all second: but.. 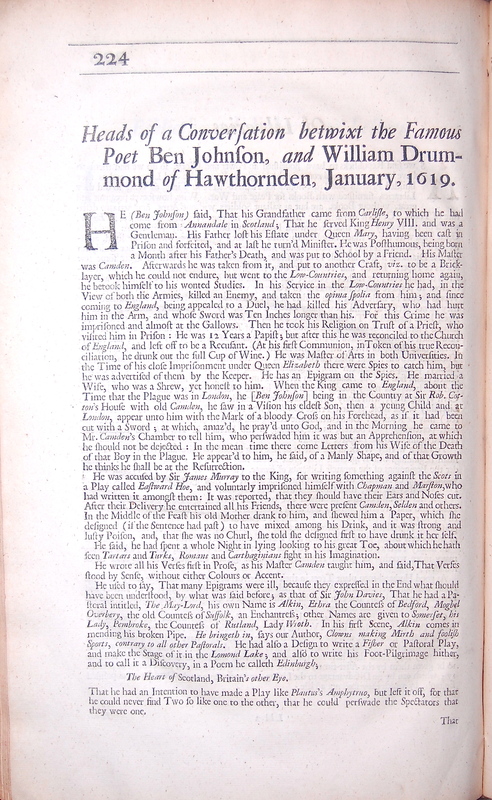 This retelling and printing is from the 1711 first edition of Drummond’s Works. Folio, 8.5 X 13 inches. First collected edition [ ],a-l2, m1, a1, B-Z2, Aa-Zz2, Aaa-Qqq2, A2.A-P2. 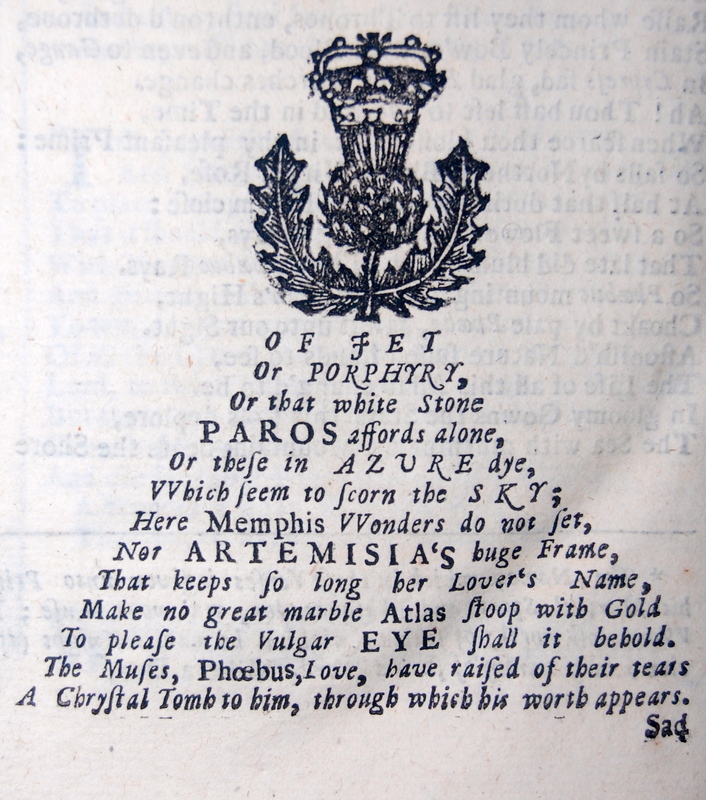 This copy has seven full page plates and one interesting shape poem!! This copy is bound in its original full calf binding, it has been recently rebacked retaining the original spine. This is a wonderful copy of this book. 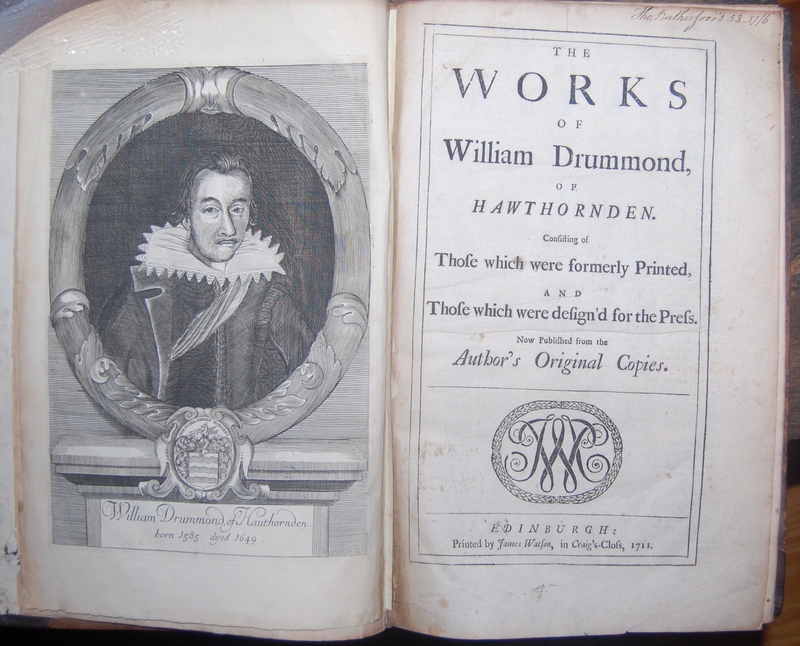 This is the first edition of Drummond’s works, printed under the supervision of his Son, it contains a brief life of Drummond and his letters to Ben Jonson and other poets of his day. William Drummond is the last significant figure in Scottish poetry before the Eighteenth Century. The gap between him and Alan Ramsay indicates a crisis in Scottish literary culture brought on by the departure of the Scottish court to London with the accession of James VI of Scotland to the throne of Great Britain. James had been a patron of poets, dabbled in poetry himself and delivered himself of Rewellis and Cautelis [Do’s and Don’ts] for its composition. Not only had the court been a centre of literary activity where men of letters such as Drummond’s uncle, William Fowler, and his friend William Alexander of Menstrie, later Earl of Stirling, gained employment, it had also given authority to Scots as a literary language. These conditions were now abolished. Poets who had published their work in Scots, followed James in revising it and publishing it in English, and Drummond, who did not go south with the court, was left in a state of cultural bereavement. He made a lot of that melancholy state. He became a poet of retreat and death, like Henry Vaughan during the Interregnum. 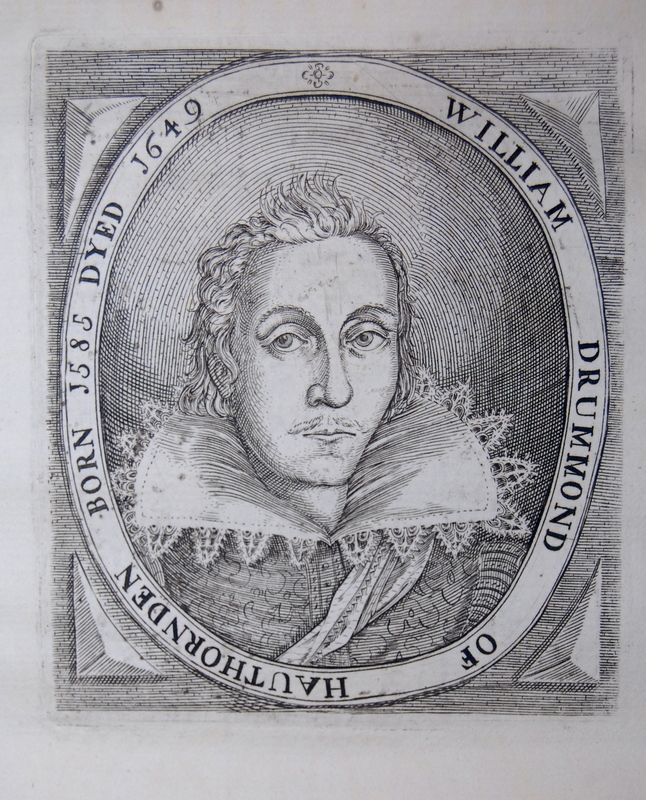 Drummond was born in 1585, the eldest son of John Drummond, descended through a cadet branch from the Drummonds of Stobhall, Lords Drummond of that ilk since 1471, and of Susannah Fowler, daughter of a well-connected Edinburgh burgess. John Drummond acquired the property of Hawthornden, where the North Esk runs through a romantic gorge near Dalkeith, and was made gentleman usher at the court of James VI in 1590. William Drummond was educated at the High School in Edinburgh and at Edinburgh University, where he graduated MA in 1605. He completed his education by travelling to France, visiting Paris and studying law at Bourges. On the way out and on his return in 1609, he stayed in London. He became laird of Hawthornden on the death of his father in 1610 and thereafter seldom left his estate, where he dedicated himself to literary pursuits, accumulating an excellent library and rebuilding the house as a Scots baronial mansion. Like everyone else, he published a lament on the death of Prince Henry in 1613, “Teares on the Death of Moeliades”. Poems followed in 1614; most of these were included and revised in the 1616 edition, whose first part is a celebration of a love for Auristella and the second a mourning of her death. The “Teares” for Prince Henry is included and there are additional madrigals and epigrams, but the main body of the collection is a two part series of sonnets and songs like Sir Philip Sidney’s Astrophil to Stella and Sir William Alexander’s Aurora. Drummond was a late practitioner of the Petrarchan sonnet sequence in English, but he worked in phrases and ideas of the French and Italian masters of late petrarchism. Marino was an author he admired and imitated. The language he writes in is not the Scots he spoke but a literary English, as correct as he could learn to make it from reading books. His art aims at refined sweetness both in versification and in the preciosity of his reworking and tinkering with petrarchan imagery. The landscape of his love-melancholy is a solitary and Arcadian Midlothian. The love affair he writes about so artificially has a very oblique relation to his life. His Auristella has at least some connection with Euphemia Cunningham, who lived by the Ore, or Ora as he has it, in Fife. Like Poe, Drummond seems to have felt that the death of a beautiful woman was the best subject for poetry and Euphemia Cunningham did her best for him in this respect. Only a year after he had completed the Poems that end in mourning her literary epiphany. Religion was another source of melancholy interiority that he exploited; he expanded the divine poems of the 1616 collection and brought them out as Flowres of Sion in 1623. The volume includes his prose meditation on death, The Cypresse Grove. In 1617, James visited Scotland, and joining in the public rejoicing, Drummond published “Forth Feasting” to celebrate the occasion. Drummond’s Poems were a success. He had already made the acquaintance of Alexander in 1614 on a chance visit to his house in Menstrie; he records the hospitality and literary chat in an attractive letter. Through Alexander, he struck up an epistolary friendship with Michael Drayton; and Ben Jonson visited him in the summer of 1618, having walked up to Hawthornden from London. The notes of his talk are among the best things Drummond wrote.